Every month, the Virtual Book Club highlights a different children's author. Those who are participating read any number of books by the author and then come up with an activity that corresponds with at least one of the books. I first saw the Virtual Book Club mentioned several months ago on Teach Preschool, and I was instantly intrigued; it took two things I love (picture books and children's activities) and combined them. And by the end of the month, a wealth of ideas had been shared and saved for future reference. I saw so many activities that I would never have thought of myself. Of course, I was itching to participate but found the task a little daunting. I'm really good at copying what other people do--not so good at coming up with my own ideas (as you will soon see). This month, the Virtual Book Club is showcasing the books of the much-beloved Dr. Seuss. And finally, after months of sitting on the sidelines, I'm excited to not only see all of the great ideas from others but contribute in a small way myself. Now Dr. Seuss...I know many who love him and many who don't. I tend to be on the "mostly devoted fan" side. I say "mostly" because I don't love The Cat in the Hat, and since that is probably his most famous and popular work, I'd probably have to love it to be labeled an "always devoted fan." Still, there are many, many, many Dr. Seuss books that I do love. In fact, the more books I read of his, the more I not only like them but can really see the wit and, dare I say, genius behind them. 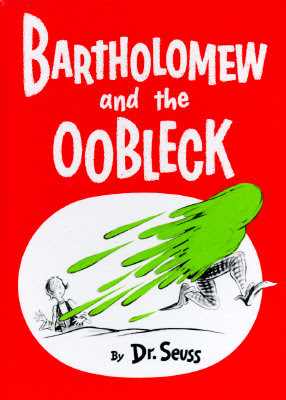 Earlier this month, I checked out some Dr. Seuss books that we had not read yet (The 500 Hats of Bartholomew Cubbins and If I Ran the Circus, among others), but it was Bartholomew and the Oobleck that really appealed to us (in spite of its unwieldy length). Bartholomew Cubbins serves as King Derwin's page boy. (And fyi, we read The 500 Hats of Bartholomew Cubbins after we read this one, but apparently, it comes before.) When the story begins, King Derwin is ranting because he's tired of the same old snow, fog, sunshine, and rain falling down from the sky. He wants something different. And so, although Bartholomew warns against it, he calls in his magicians, and they promptly set to work conjuring up "Oobleck." The king has no idea what Oobleck is, but he is terribly excited about it nonetheless. Bartholomew, on the other hand, feels nothing but trepidation and dread, as well he should since the next day, green globs and blobs begin falling from the sky. The consequences are disastrous until Bartholomew tells the king what he must do, and the king follows through. Of course, as I was reading this story to Aaron and Maxwell, the third thing I thought of (right after, This story doesn't rhyme! and Wow, this is one long book!) was, The boys would loooove to make their own Oobleck. And then, following close behind was my fourth thought, And probably everyone who reads this book thinks the same thing. But I decided, original or not, that's what we were going to do. 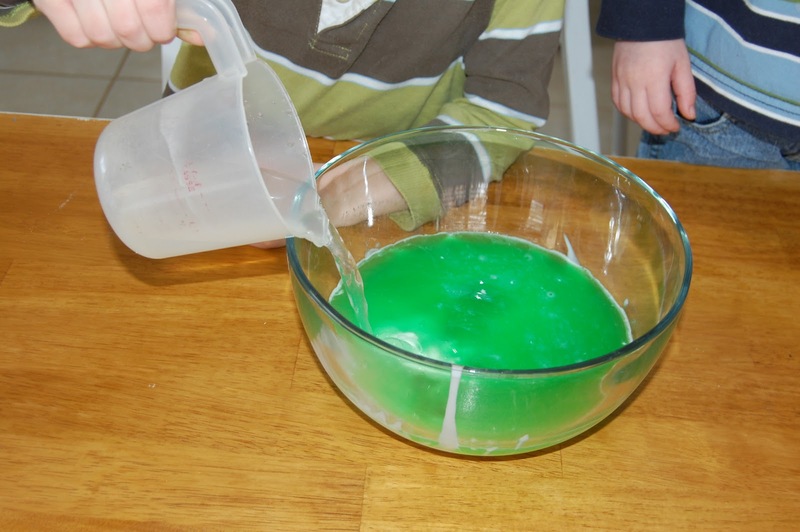 After all, Aaron and Max had never made Oobleck before, so it was original to them. 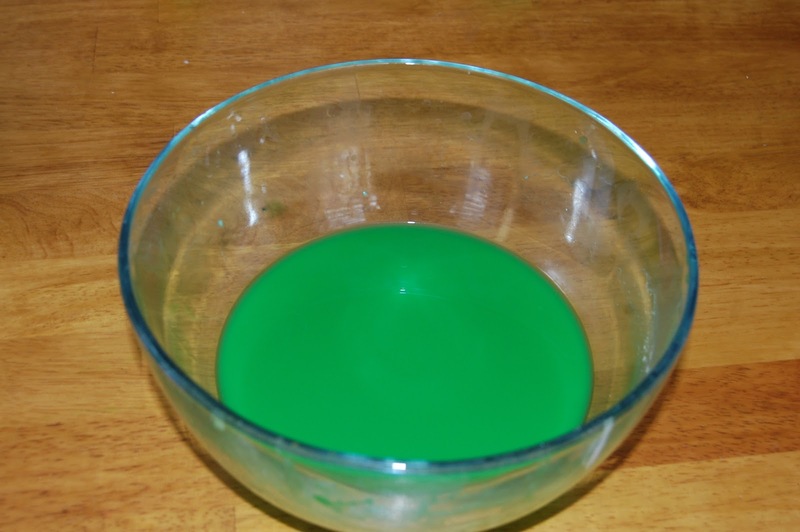 After searching the internet (and confirming my suspicions that a bazillion people had already labeled their gak, slime, or silly putty as Oobleck), I settled on three recipes I wanted to try. I figured it would not only be three times the fun (and mess) but also provide a little science experiment as we compared the different concoctions and decided which one was the most Oobleck-ish. 2. 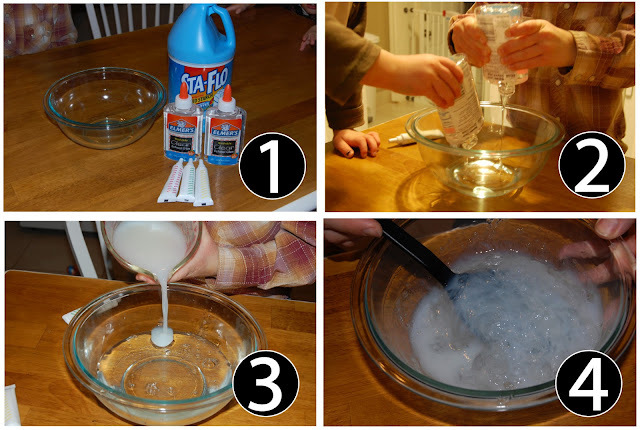 Pour both bottles of glue into a large bowl. Let them drip for a minute. 3. 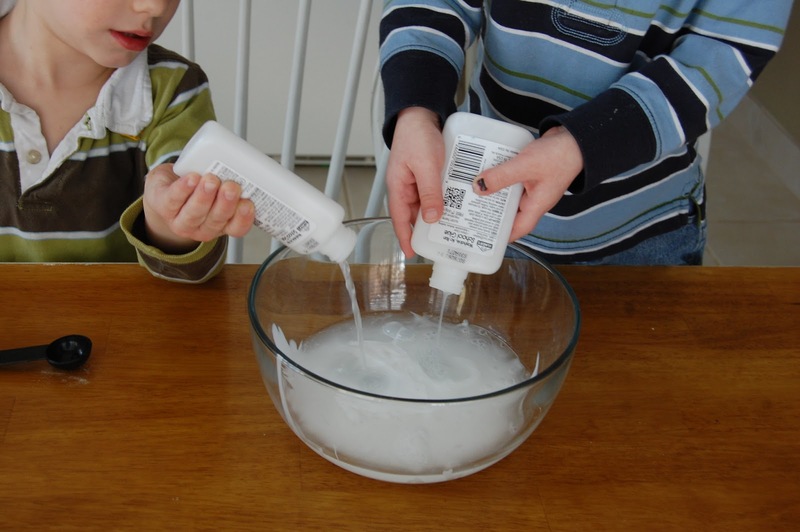 Fill up both of the now-empty glue bottles with warm water, shake them up, and dump them in the bowl. 4. Add the food coloring. You don't need much. I added several globs with this batch, and it was too much. 5. Mix it up a little. I did very little mixing at this point, and after I added the borax (in the next step), I wished I'd done it a little more. So when I say "mix it up a little more," that's said in hindsight. Not too much, but a little. 6. 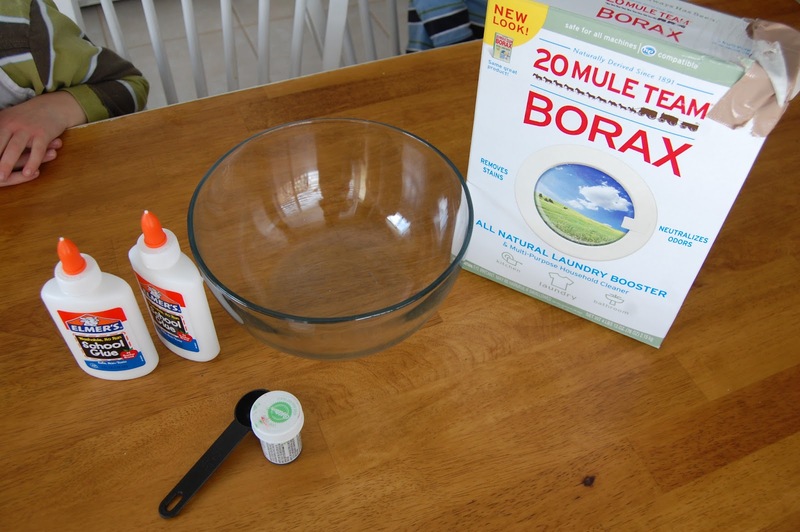 For the borax, you want to add 1 tsp. of the stuff to half a cup of warm water. Mix it up until it's dissolved. (I had to heat my mixture up a little in the microwave before this happened.) Then slowly add it to the glue mixture. 7.Mix it up--first with a spoon, then with your hands. It's going to be really gooey and globby, and you'll probably think there's no way it's going to turn out and you must have done something wrong along the way. Have faith! This is where I stopped taking pictures because when you're in the throes of disaster, who thinks of grabbing a camera? 8. Play with it! 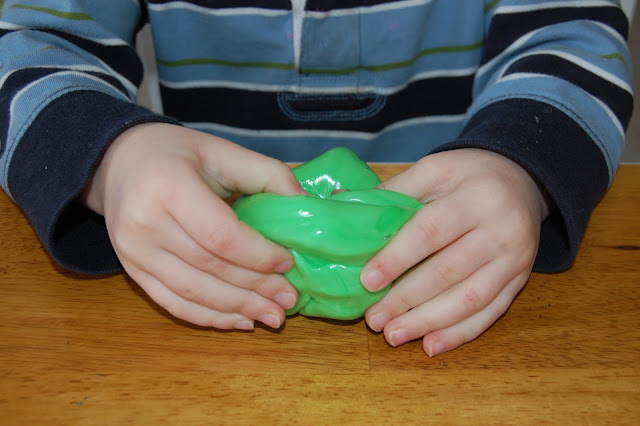 This Oobleck has a great consistency. It felt just like Gak. It will stretch or break depending on what you do with it. Plus, it isn't sticky and doesn't dry out, so it isn't very messy at all. Aaron and Max were pleasantly surprised with how it felt (I think they were just as worried as I was when they saw the floating gunk in green liquid). They loved squishing it, molding it, shaping it, etc. After awhile, we decided to get the Little People out, so they could play in the Oobleck, too. This was super fun and made it seem even more like the Oobleck in the story since it covered up the people and their vehicles got stuck in it. 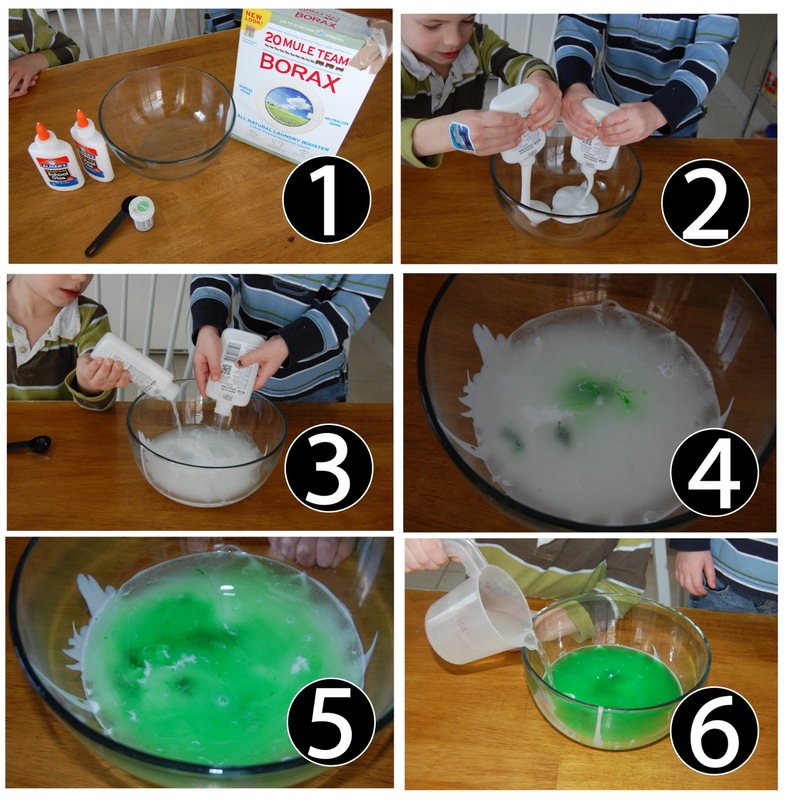 Before moving on to our next Oobleck experiment, I need to say a few things about borax. 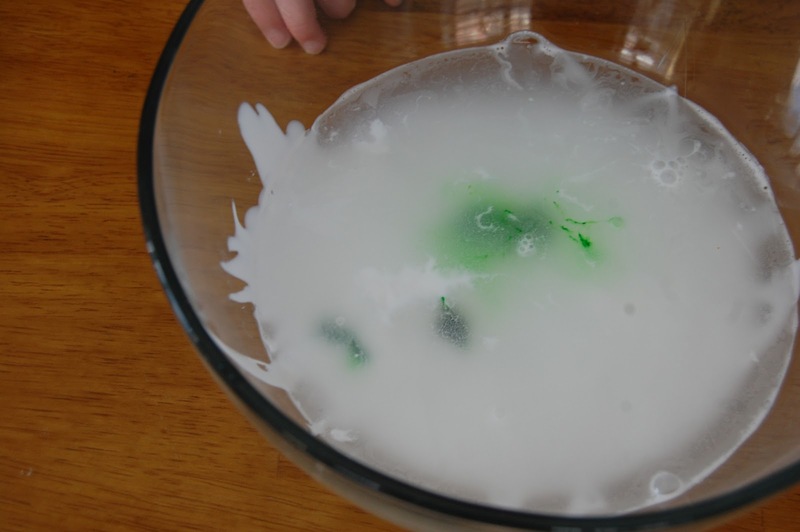 Borax is toxic, and so this Oobleck should not be given to any children who still put things in their mouths (hence, Bradley did not get a turn). I also warned Aaron and Max not to eat any of it. 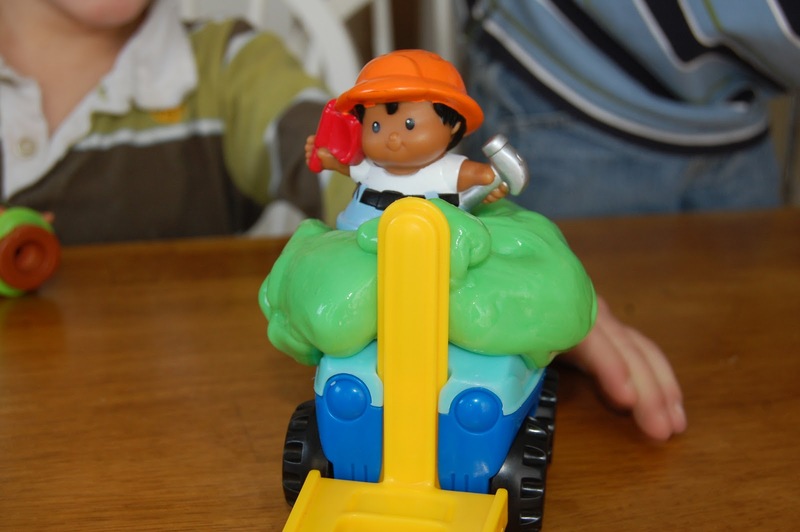 After they were done playing with it, I had them wash their hands, and I also washed all of their toys. Even though it uses a very small amount of borax, I would still play with it with caution. Because I was a little worried about the borax, I decided to try a supposedly less toxic version. 3. Slowly add the liquid starch. 5. Play with it. This was definitely different from the borax Oobleck. It wasn't as firm, it felt more wet, and after playing with it for awhile, you had to squish it back into a mound and let it sit for a minute before it was playable again. 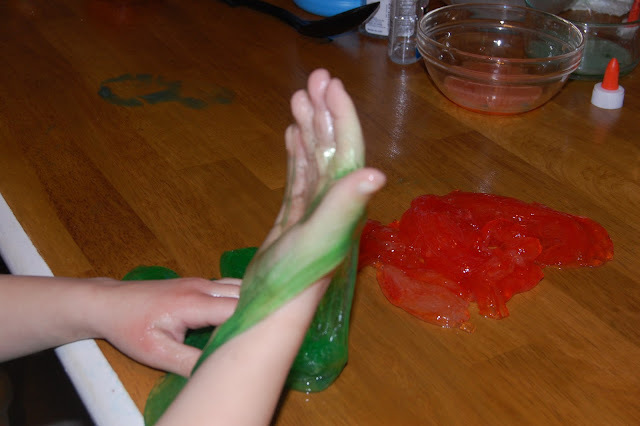 One of the things you could do with this one that you couldn't do with the borax Oobleck was stretch it really, really thin, almost like a latex glove. Bradley did get to feel this one (closely supervised), and he absolutely loved it. He couldn't stop touching it and exclaiming over it. And of course, the Little People had to make an appearance with this stuff as well. 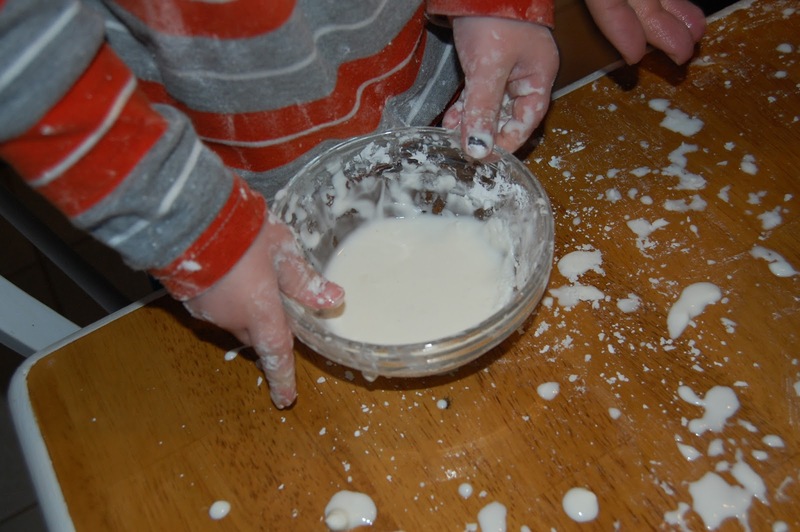 When I was looking up Oobleck recipes, cornstarch and water seemed to be the official/unofficial Oobleck. 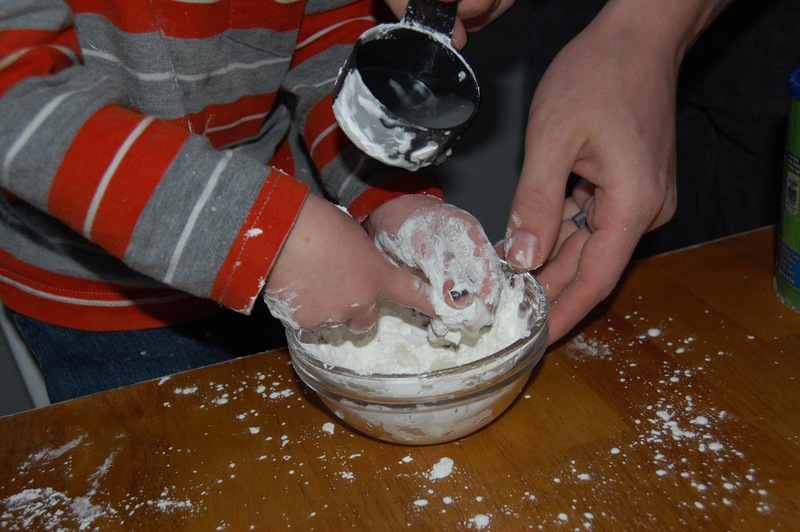 I let the boys play with just the cornstarch first because even when it is dry, it feels kind of silky. 2. Add the water slo-o-o-o-wly, mixing as you go. If it seems too dry, add more water. If it won't hold it's shape when picked up, add more cornstarch. If you've played with this stuff before, you know what it's supposed to be like: you should be able to roll it into a ball, but then if you stop rolling, it should immediately start melting back into a liquid. It's really crazy. 3. Play with it. I'm not going to lie, this one was MESSY. It cleans up really easily, but I still didn't have any desire to pull out the Little People. Aaron and Maxwell thought it was fun, but Max had a little bit of trouble getting it to firm up under his fingers. Aaron said he liked the first one best (the borax and glue version), but he and Max seemed to enjoy playing with all three of them. I thought the second version (liquid starch and glue) seemed the most similar to what I pictured Oobleck being like in the book. I actually thought the third version (cornstarch and water) was the least like Oobleck even if the internet says otherwise. The first two Ooblecks can be saved in ziplock bags and played with again. The third Oobleck, obviously, cannot be saved, or even if you found a way, why would you want to? Now, go grab the book, along with a couple bottles of glue, and have some fun of your own! I also shared this post at The Children's Bookshelf. I love it. I'm totally pinning it. I absolutely love "Bartholomew and the Oobleck," and I'm always surprised at how many people haven't heard of it, since we grew up reading it. I never thought to make oobleck, though. Great idea! You are a fantastic mom. P.S. I've always wanted to do the cornstarch and water thing since Ellen DeGeneres filled up a swimming pool with it on her show and walked across it. Seriously so cool. I love that you tried three different kinds. We made the Borax version a while back and it has held up very well. I have a bottle of liquid cornstarch that I have been meaning to put to use. We did have a little more luck with the water and cornstarch. Ours came out a bit thicker and we could pick it up and it would ooze out of our hands. 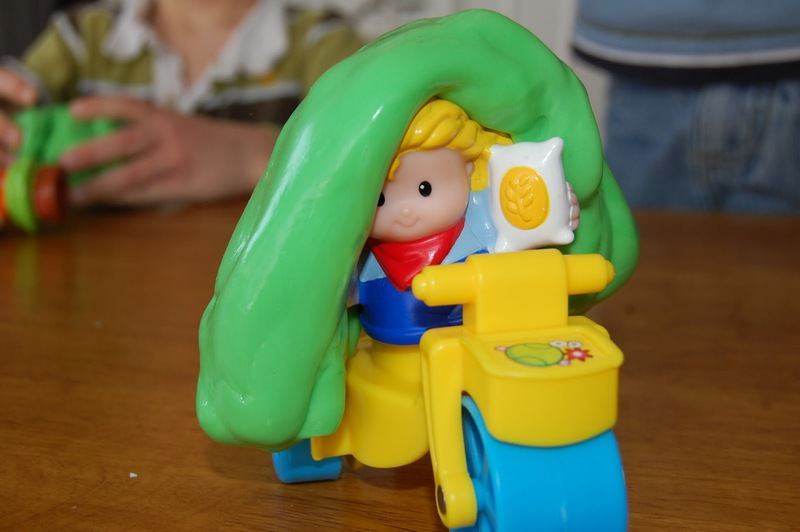 You can check it out here if you want http://www.fantasticfunandlearning.com/o-is-for-opposites-wet-and-dry-sensory-play.html. I love your post about the wet/dry messy play! Our cornstarch/water actually did perform like it was supposed to, but I think we would have had even more fun if, like you, we could have done it outside and made MORE of it! Oh, well. This summer, right? 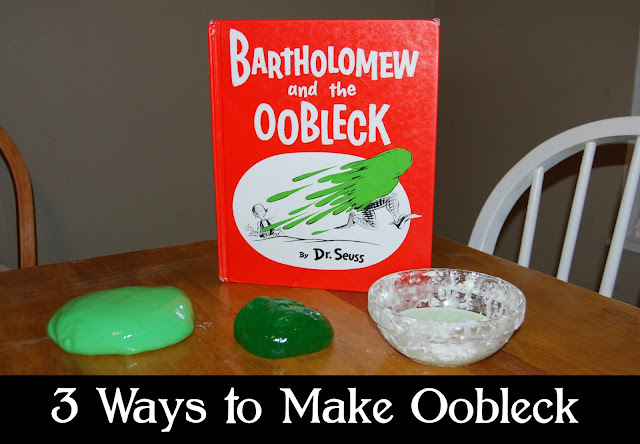 I love that you showed us three ways to make oobleck! Great idea to give families options! I would be happy to link it to your Countdown. Thanks for letting me know about it! Voting on Oobleck #1!!! Looks fun. 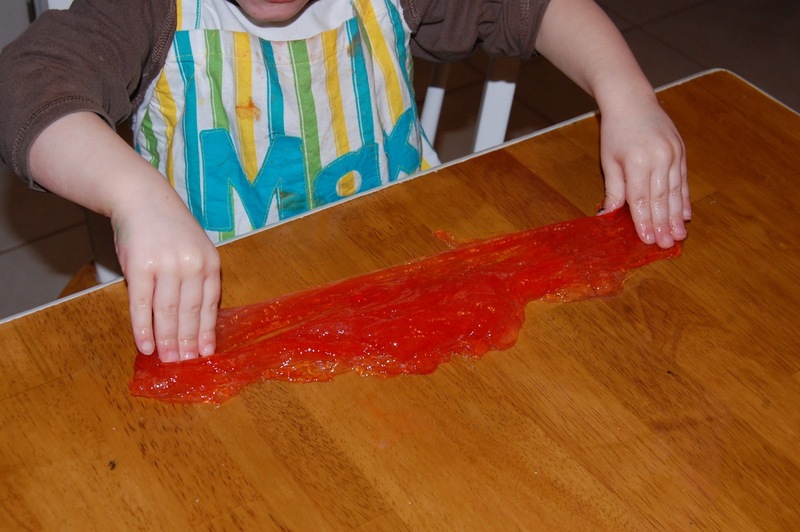 I could never get my son to play with goopy things, he didn't like to get his hands messy. It always looked like so much fun. Thanks for sharing at The Children's Bookshelf. 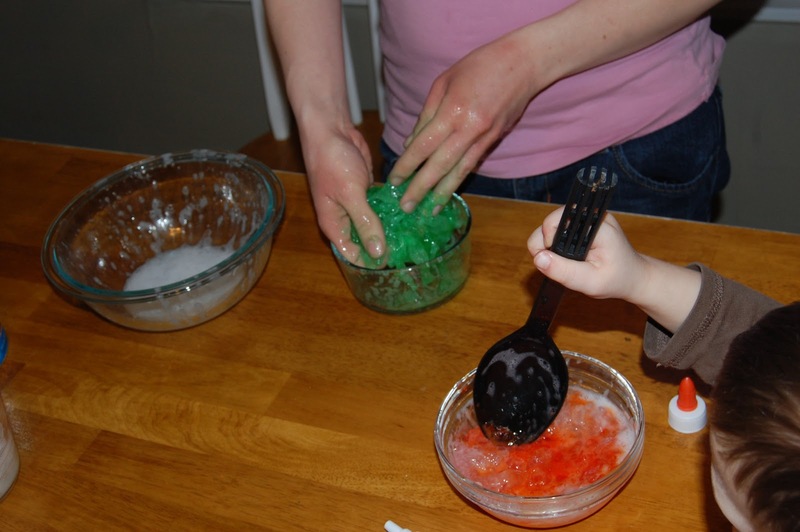 The first Oobleck wasn't really messy or goopy at all (after the initial stirring and kneading, that is). It didn't stick to my boys' hands or the table or their toys. I was actually surprised (and pleased) with how un-messy it was! I love how you did an oobleck recipe test! This looks like a lot of fun. I've done a crude version of this with just cornstarch and water -- and my son and I had a blast. I think it is time to get a bit more sophisticated and do it your way. This is a fantastic post. Thank you! Thanks! I hope you have fun trying them out! Yay! I can't wait to check it out. Thanks for letting me know! If I wanted to make this for my class of 19 studetns and wanted to allow each of them to have some to take home, whould you double the recipe or do you think that this would make enough? The ones with glue make about two cups, so I think you'd for sure want to double it-- maybe even triple it? Have fun!